DIYARBAKIR-A delegation consists of PAC Chairman Mustafa Çelik, PSK Chairman Mesut Tek, Chairman of the Kurdish Democratic Platform Sertaç Bucak, Turkiye-Kurdistan Democratic Party Chairman Mehmet Emin Kardaş, Azadi Movement spokesman Ayetullah Aşti visited HUDA PAR President Zekeriya Yapıcıoğlu on Wednesday. The next election and alliance reportedly were discussed in the visit that held in HUDA PAR Diyarbakır provincial presidency. 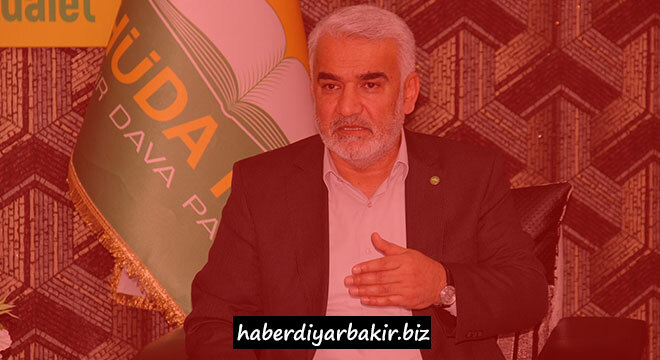 Having a statement after the visit, HUDA PAR President Zekeriya Yapıcıoğlu said, "We had meeting offers with the parties who got the right to participate in the elections 6 days ago. We held meeting with a few of them. Today we have election-oriented negotiations with 4 political parties and a political movement that will not participate in elections but continue to work as political parties. There was a productive conversation about the alliances. These negotiations may continue. We believe that there is a suitable ground. I hope that this meeting will be beneficial for both our nation and our parties. "There are 11 parties with the capacity to participate in the election, one of them is HUDA PAR. We offered a meeting to those 10 parties. We have had the meeting with 5 parties so far. AK Party is one them. We met with Mr. Erdoğan, the AK Party Chairman as well as the President. We had an interview with Felicity Party at the level of the Chairmen. Apart from these, we have held negotiations with the IYI Party, the Vatan Party, the Grand Unity Party at the level of vice presidents. We do not have an actual meeting yet with 5 other parties who are eligible for electoral participation, but we are waiting," he added. "Our first visit was to HUDA PAR means we see HUDA PAR very close to ourselves. We will visit HDP on Friday. We have stated our intention," said PDK General President Serdaç Budak related their visit to HUDA PAR.